Everything in your home gym needs to be accessible and space saving. When you go to workout in your gym, the last thing you want to do is have to dig for what you need. That’s a pain!! Also, The more open space you leave for cardio and bodyweight exercises the better! Keep it clean and organized so that you want to go in there! If your equipment is a pain to get out, you will never end up using it. Also, if you keep it clean you will feel clean and refreshed going into your workout. Hanging mats and cleaning spray: Bottom line, if you have a clean, soft mat, you can workout! The hang on the wall to save space. This is a must. 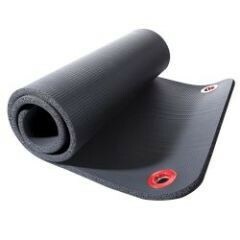 Keep your cleaning spray close and accessible so that you never feel grungy on your mats. TRX and anchor: This is my favorite tool ever. Suspension training is amazing, the video that comes with this piece gives you hundreds of exercises. You can work any muscle group with this baby. You can anchor it on a wall, pull-up bar, or a jungle gym nearby! 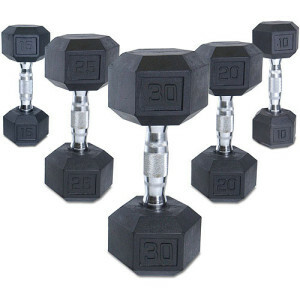 Dumbells: For women, I would say you want to start with 5lb, 10lb, 12lb, 15lb, and 20lb weights. For men, I would recommend starting with 10lb, 15lb, 20lb, and a couple between 30-45lbs. I stay in these weight ranges with all of my clients. Honestly, with a great mat, TRX, and dumbbells, you can do just about any type of exercise!! Bench: A sturdy bench is an awesome tool! 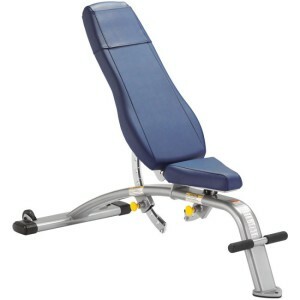 You can do a lot of bodyweight exercises on a bench (ie: tricep dips, box jumps, step ups, incline pushups, reverse crunches, etc) and with an adjustable bench you can do your exercises at an incline or flat on your back. Also, make sure you can move your bench easily to create more floor space when you need it. Some of the cheaper benches are wobbly and unstable. Make sure to see it in person and get a good feel for it. Airex : You can use this balance pad until you die. It is so important to constantly be challenging your balance. It is the first skill to go as you age. Everyone should be working on their balance daily. This buddy is great for single leg balancing, plank workouts, and so much more! 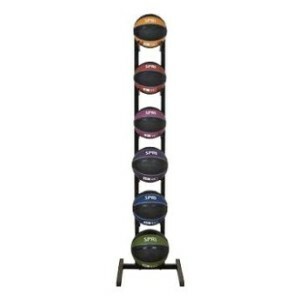 Med balls with rack: The med ball rack is awesome for saving space. You can usually hang your jump ropes or resistance bands on it as well! As for the medballs, they really add a unique dimension to your workouts. 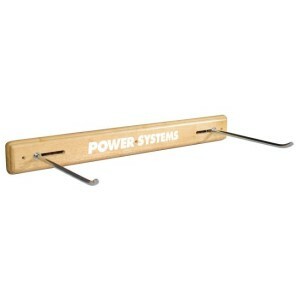 You can throw them to a partner, throw them against a wall or on the ground, and use them for rollouts and planks! 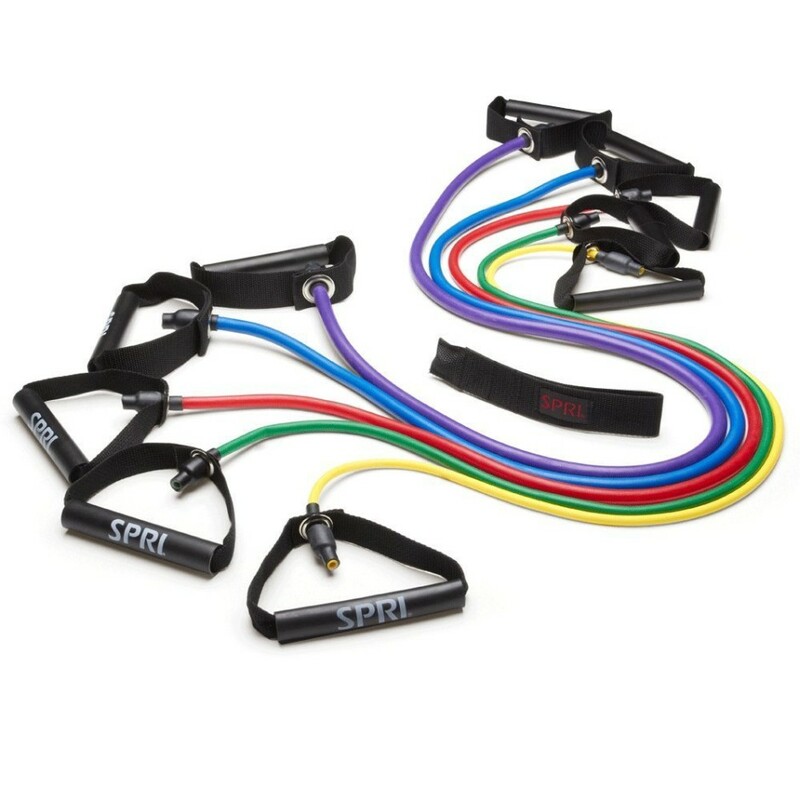 Resistance Bands: Purchase a variety of colors for different levels of resistance. The bands are great can be used for arm, leg, and ab exercises! Again, they add another dimension to your basic workouts! 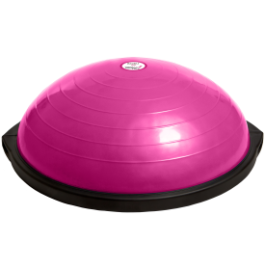 Bosu Ball: As we get away from your more basic tools, this is another one that is an awesome addition. It is a little more advanced balance tool than the Airex. It can be used for toe touches, jumps, unstable squats and arm workouts, burpees, plyos. There are so many fun elements to this guy! 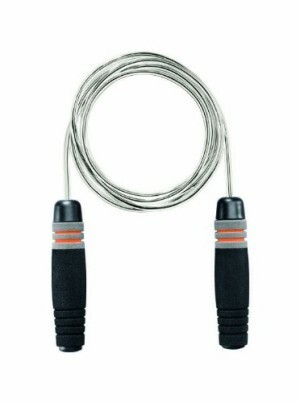 Jump Ropes: I personally love to jump rope. It is great cardio that can make a huge impact in 1 to 5 minutes. It takes focus, coordination, and balance! Bike/Elliptical/Treadmill– All of these machines are good, especially if your weather would keep you from running or walking outside. If you have leg injuries, the bike or elliptical are definitely easier on your joints. The thing to keep in mind is that if you are going to purchase one of these machines, save up and invest in a good, solid, well made version. If you get one that is cheap and bounces or jiggles or falls apart, you will not want to use it. You will waste your time and money. Take your time building your gym and buy nice equipment. Television or Speakers- Try to make your workout as enjoyable as possible. What gets you fired up?? If you workout harder blasting country music, make sure you get your music set up to blare those sweet honky tonk jams in the gym. If you workout harder when you are watching the news, install a TV!! Do what works for you!! Set yourself up for success! There are so many amazing pieces you can add to your gym. These are the ones I like the best to start. Enjoy! !